And nothing more than sayin' "I'm alive." This is a song about a friend of mine [David Rea] who lives in Toronto, Ontario – actually he’s an American and he’s up there avoiding the draft. If you all read the Fifth Estate - the cartoon on the front page of the latest one is something about a woman who said “I didn’t raise my son to be a Canadian”… that’s the punchline. (laughter) Spoils the whole joke for ya. Anyway, David’s up there hiding and in his spare time he’s being an accompanist for Ian and Sylvia. So you get an idea that he’s a very very fine guitarist. So little David looked up all wide-eyed and he said “Gee I don’t.. I don’t wanna go kill him ‘cause I haven’t even met him yet and for all I know I might even like him and besides that my mother was a pacifist and my father was a pacifist and uh… I’ve got flat feet and (laughter) if you want I’ll get a note from my psychiatrist (laughter). But the king looked at him and said “Little David, you’ve been drafted.” So little David was drafted and off he went to find poor old Goliath and to kill him and he’d been on the road about two days when all of sudden the sky in front of him went all black and he heard coming down the road and thump and a thud and a thump and a thud and he knew that was Goliath coming. So he kind of chickened out at that point and he jumped into the nearest ditch and sort of covered himself over with leaves and things like that and he had hoped that Goliath wouldn’t discover him but Goliath wasn’t so dumb and he said “Fe Fi Fo Fum, I can smell ya little David” (laughter). See, because Goliath had an extra-large nose and plus that musicians we all know belong to the great unwashed (laughter) so there wasn’t much of a problem. So he picked up little David between his thumb and his index finger and he pulled him out of that pile of leaves and he kind of dangled him in the air and he said “Little David, the prophets tell me that you’ve been sent out to kill me.” So, little David remembering what he was supposed to say said “I challenge you, Goliath”. And there he was, carrying only his trusty little bag of harmonicas which a lot of people confused with a slingshot. And slapped the ole Goliath on the wrist a couple of times and Goliath just said “ha ha ha, doesn’t hurt a bit” and then he… all this time he was carrying over his shoulder a big, ugly looking axe. And at that point he took this axe down off his shoulder and he opened up the case and he commenced right then and there to tuning it. David took out his A harp, ‘cause that’s the key that the giant was playing in. And so the challenge began and they played the best part of an afternoon and when the day was done they decided that they really liked each other after all and they didn’t need the king’s old combo – that they would go off because they’d read in the paper that Noah was conscripting people, you know, to go on board and they thought they’d have a little difficulty - mainly because they didn’t match too well in size and because they were both male – but they figured that they could pull it off somehow, maybe the giant would go in full drag or something (laughter). So that way they could play in his royal combo on the boat. And first of all they dug a big pit and they put a tombstone on it which said “Here lies Goliath, Rest in Peace” and then they went off to join the Peace Corp (laughter and applause). That’s the little David story and this is my song for him now that you know a little bit about him. I have listened to a 1966 recording of Joni singing Play Little David and I think she has such a beautiful sweet voice. 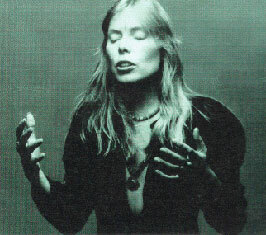 I have been listening to Joni for years now, yet she can still amaze me with gems like this.